I would like to thank Natasha of 5 Star Foodie Culinary Adventures for the motivation to makeover my living room into a French Bistro by inviting Taste With The Eyes to participate in the 5 Star Makeover Summer’10 Special! She has asked 10 bloggers to Guest Post over the summer and recreate classic dishes to share on her 5 Star Foodie blog. I am honored to be one of the 10! Thank you Natasha. 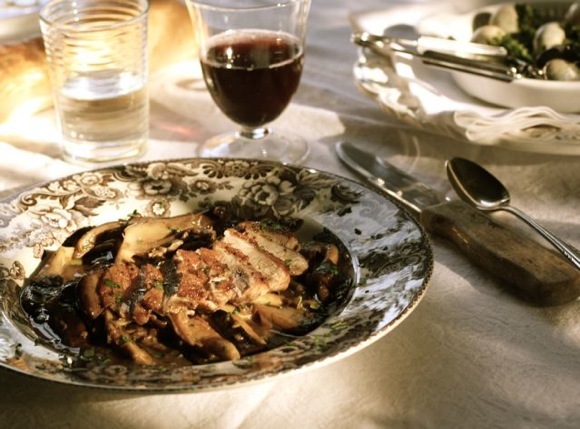 We’ve cooked Bistro Duck and Wild Mushrooms Two Ways; CLASSIC and CONTEMPORARY. 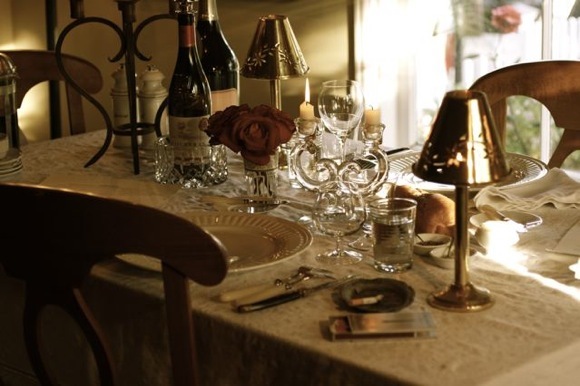 It was great fun setting the table and searching the house for bistro-style props. We especially enjoyed the makeover: creating le plat du jour. Now both of these duck dishes have a place on le menu at Bistro Lori Lynn. Natasha’s 5 Star Makeover Summer ’10 Special event is sponsored by MarxFoods. I received a treasure box of samples in the mail which included various dried mushrooms and szechuan peppercorns and flor de sal (the Portuguese version of fleur de sel) which were used in these duck dishes. It also contained fragrant vanilla beans and dried candy cap mushrooms with their heady aroma of maple syrup, which I’m saving for another time. Thank you MarxFoods! Sauté chopped garlic and shallot in butter until translucent. 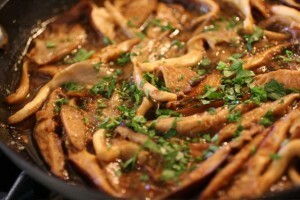 Add fresh oyster and shiitake mushrooms. 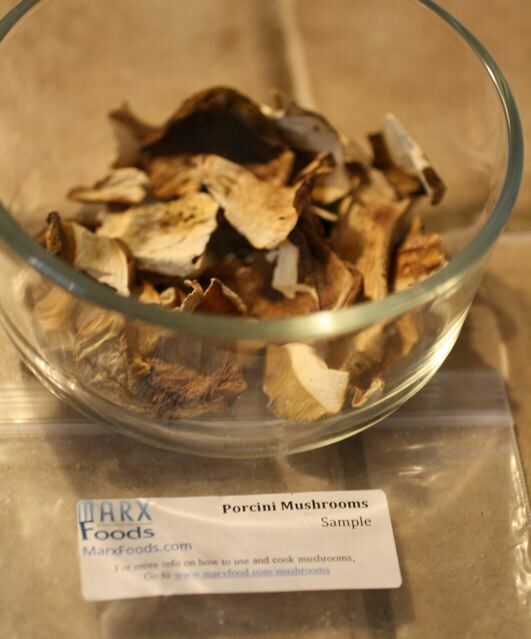 When oyster and shiitake are softened, add reconstituted porcini. Then add about 1/3 c. of white wine and reduce. When the wine has reduced by half, add about a cup of beef stock and reduce again. Season with salt and pepper and finish with chopped parsley. 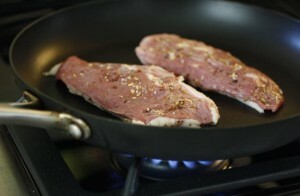 Meanwhile, cook the duck: Trim duck breasts of excess fat, then score the remaining fat with a sharp knife. Season both sides with salt and fresh ground pepper. Place in a sauté pan fat side down. Turn the heat on high. When the skin becomes crisp, turn over the breasts and cook over medium heat until desired doneness. 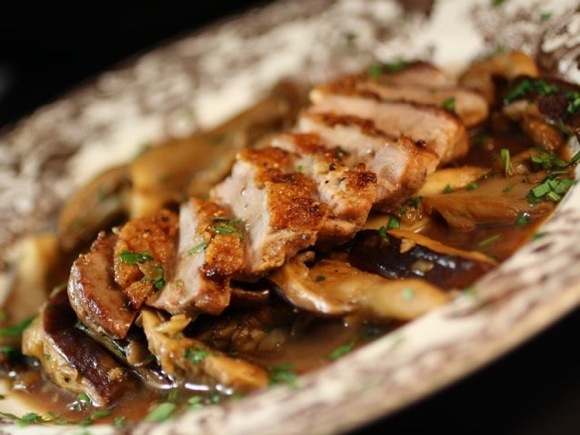 Serve sliced duck breast over the mushroom sauce. Voila! The CLASSIC dish. Bon Appetit! 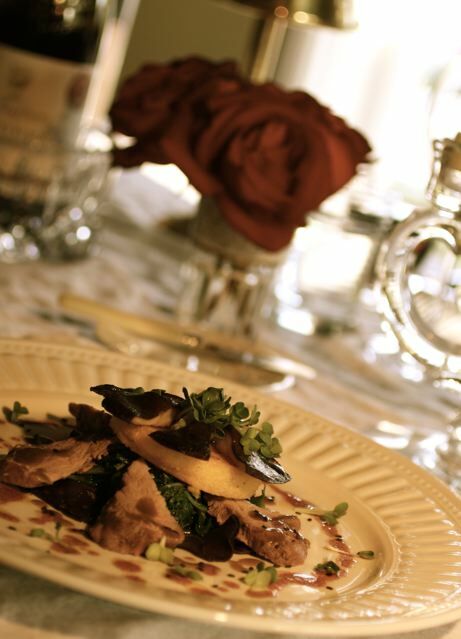 Do you notice we are serving escargots at Bistro Lori Lynn too? Are you ready to order? Do you prefer the CLASSIC or the CONTEMPORARY dish? 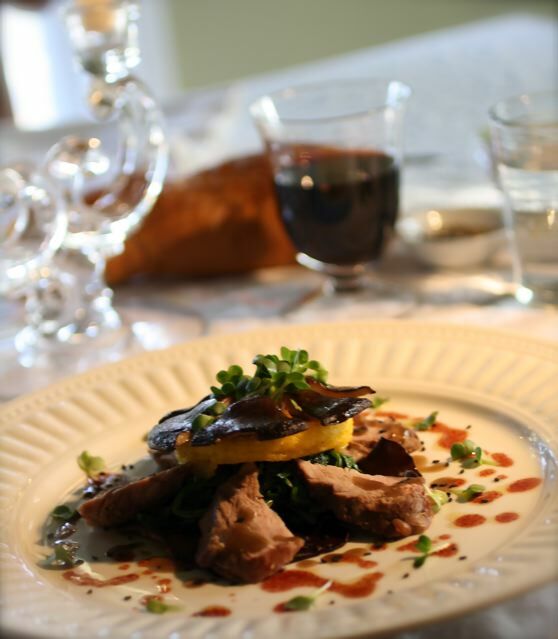 The CONTEMPORARY Bistro Duck and Wild Mushrooms incorporates exotic ingredients from different cultures. Pomegranate brings a note of refreshing sweetness while the porcini sauce adds an element of earthy richness. 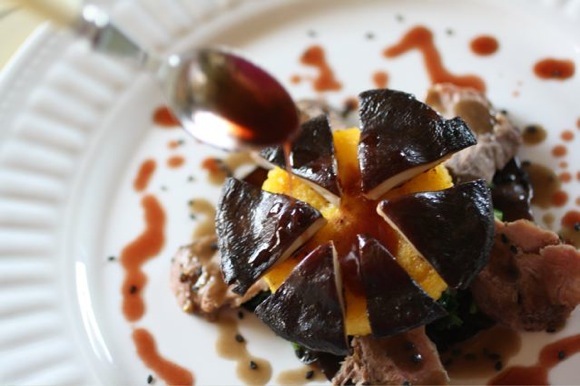 The crunchy wood ear, the silky roasted shiitake and the crispy polenta cake add a variety of textures. Radish sprouts, polenta, pomegranate, and the emerald green mizuna add striking color in contrast to the CLASSIC dish. 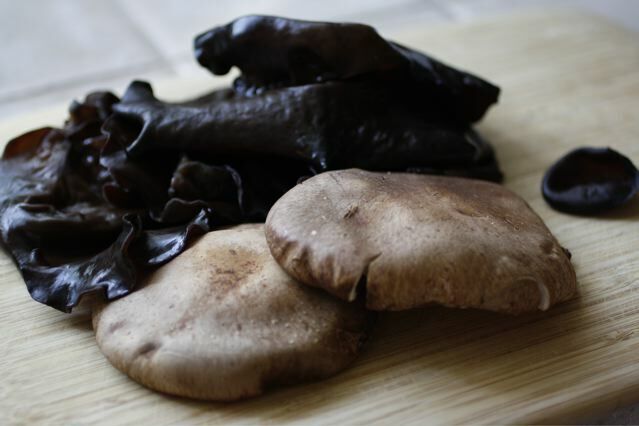 Toss wood ear and shiitake with toasted sesame oil, tamari, and fresh ground black pepper. Roast covered in a 400° oven for 20 minutes. 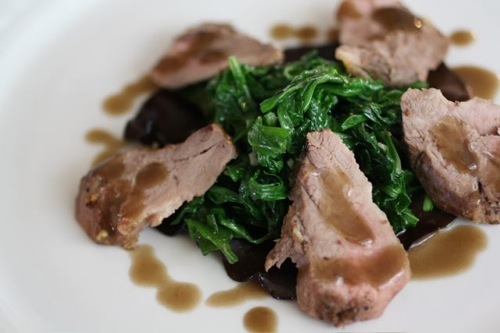 Prepare the duck breasts like the ones in the CLASSIC dish, but substitute flor de sal and szechuan pepper for seasoning. When this duck breast is cooked, the skin is removed. Cook polenta, stir in a bit of butter, season with salt and pepper. 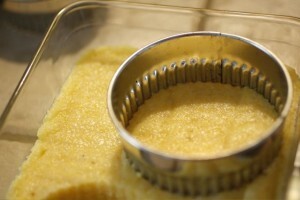 Spread the polenta in a dish to a 1/2 inch thickness. Cover and refrigerate for at least 2 hours. Cut into disks. 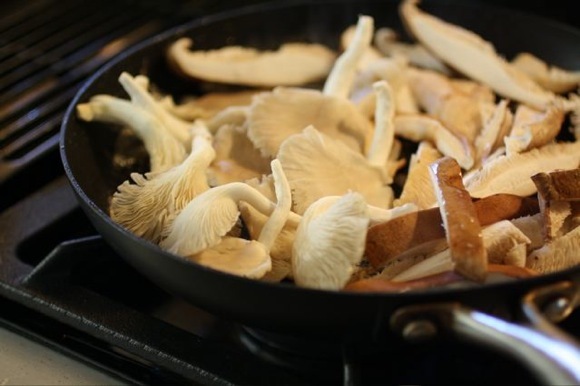 Sauté disks in butter until lightly browned on each side. 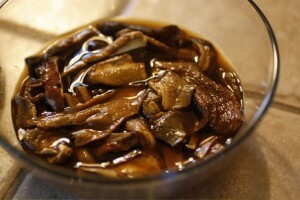 These reconstituted porcini were added to the CLASSIC duck dish. The mushroom water was saved for this CONTEMPORARY dish. 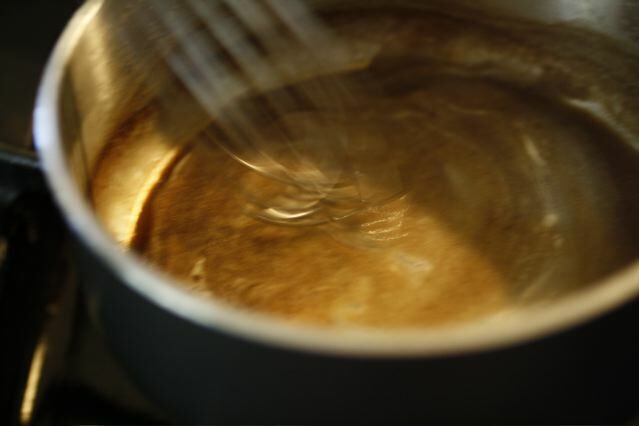 Reduce the porcini water over high heat. Whisk in butter and season to taste. 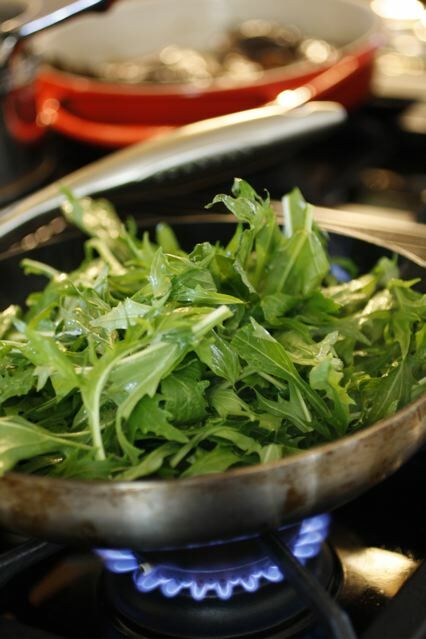 Mizuna is a Japanese green reminiscent of mild arugula. In a hot sauté pan add a scant teaspoon each of toasted sesame oil and olive oil. Add chopped garlic. After about a minute add the mizuna, which will wilt quickly. Finish with flor de sal and black sesame seeds. Place roasted wood ear in the center of a plate. Top with wilted mizuna. 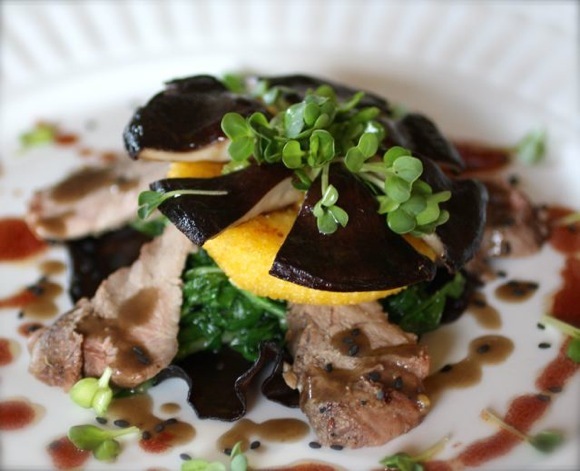 Place sliced duck breast around the mizuna. Drizzle porcini sauce around the duck. Top duck with crispy polenta cake. Then slice a whole roasted shiitake like a pie and place atop the polenta. Sprinkle the plate with black sesame seeds. Make the pomegranate balsamic vinaigrette by whisking together 1 1/2 T. of pomegranate syrup, 2 t. balsamic vinegar, and slowly add 3 T. of olive oil. Salt and pepper to taste. This vinaigrette and plating inspiration is from my favorite cookbook Charlie Trotter’s Vegetables. 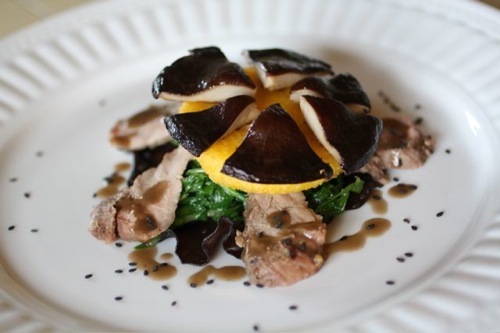 Drizzle vinaigrette over the shiitake and around the plate. Finish with a garnish of radish sprouts. Merci! Thank you for dining at Bistro Lori Lynn! Please come back soon. 5 Star Makeover Summer’10 Special: Ten special bloggers have been invited to recreate different classic dishes of their choice and share them on the 5 Star Foodie Culinary Adventures blog. These guest posts will be featured every Monday from June 28 to August 30. This event is sponsored by MarxFoods, an online store that offers fantastic high quality gourmet products. In September, a final roundup of these makeovers will be posted and readers will be able to vote for their favorite recipe to receive a fabulous prize. Beautiful recipe. Gorgeously presented dishes. That duck looks cooked to perfection. Chez Lori Lynn looks beautiful, and that duck ain’t bad looking either! Congrats to you. That’s awesome! I would be a frequent client of Lori Lynn Bistro !!! You are really gifted Lori Lynn…All my admiration! Table ambiance plays a huge part in setting the stage for the evening. 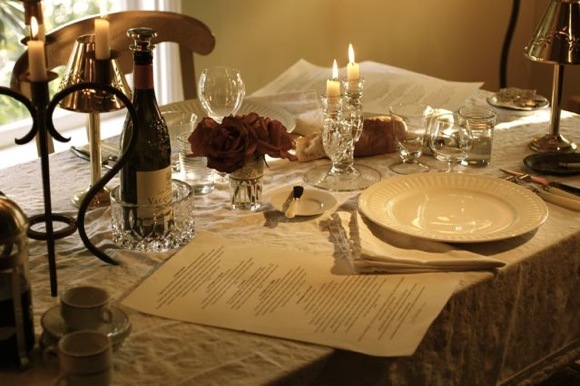 A wonderful meal completes the scene, and it looks like you have gone above and beyond with this one! Lori Lynn’s Bistro looks so inviting, and the duck entree is gorgeous! Wow, the table, the food–it all looks absolutely gorgeous. My compliments to the chef, and to the decorator! 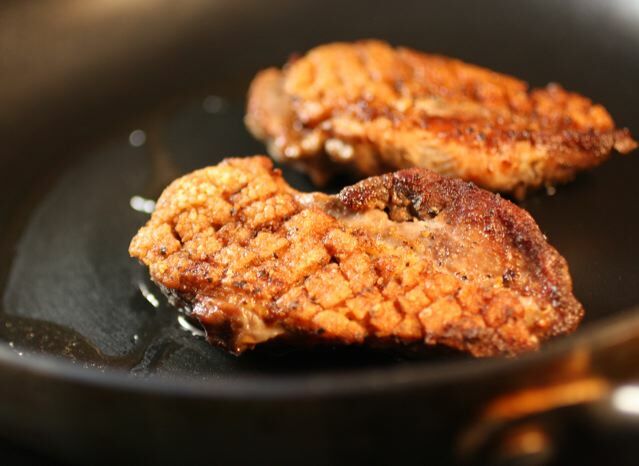 It seems that duck is on the menu in your kitchen. Your presentation is lovely. As always, beautiful presentation of food and ambiance! Taking a classic dish and transforming it into a contemporary style is always fun and challenging. Congratulations on the 5 Star Makeover, how exciting is that? Looks amazing … Kudos! If you are inspired with any other items in that little treasure box, you are always welcome to guest post with us. Open invitation. Hi Justin, I accept! Will be in touch. Ummm, table for 2 please! How I would love to be sitting at that table, eating that food. Wow, the pics are amazing and completely transported me. How fun! What a great idea – especially when it involves re-doing a room! Every bit of it is GORGEOUS! Oh Lori!! It’s 9 o clock hear and I still haven’t had dinner.. but now my mouth is watering!! This looks fantabulous!! Such lovely dishes! The best thing about food is that you really can create an environment for every meal. The duck looks amazing and so does your dining table. Beautiful. What beautiful duck dishes! One of my favorite things to eat! 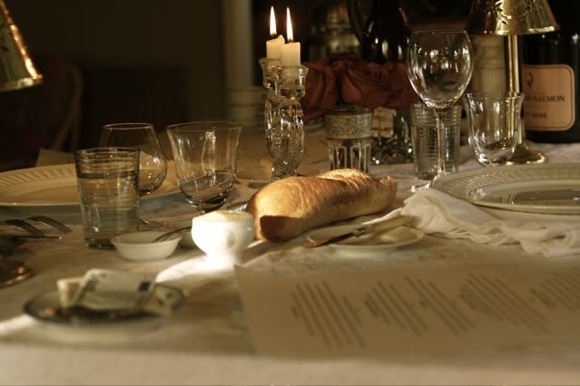 Posh table setting, gorgeous meal…envy of the neighborhood! this looks so delicious, your table settings are always so stunning as well. This is such an elegant gourmet dinner. Fabulous job! Congrats on the guest post invitation! It sounds like an exciting and enjoyable undertaking. Not only an nice honor, L2, but a delicious one, as well. Plus, I love what you’ve done with the place (and your blog, too).